Dispersion of pigments and fillers in a solution of medium molecular epoxy resin and solvents with addition of additives. 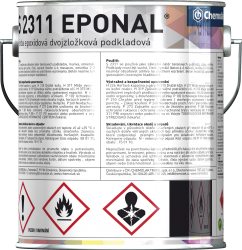 EPONAL S 2311 is used as a primer for concrete substrates, masonry, plaster. The substrates must be dry, clean, mature (concrete 4 – 6 months, plaster 2 – 3 months). They must not contain additives to accelerate maturation. Concrete must not be treated with glue or steel trowel.